*Price per User for quantities 1 or more. We provide cloud-based, enterprise grade security designed specifically for businesses with centralized control for your Windows, Mac, and mobile devices. The management console is a snap to install and easy to use. It allows you to manage your multiple device platforms via the internet, so you can access them anywhere. Worry-Free Services sends automatic updates so you can focus on your strategic business projects instead of your IT security. You can enforce your security policy to employees anywhere—whether they’re in the office or at home—and affordable pricing and annual subscription billing makes your security truly worry-free. Worry-Free™ Services, powered by XGen™ security, is a cloud-based security service that is a snap to install and easy to manage. It provides your business with industry-leading protection for your Windows, Mac, and mobile devices. It is powered by the Trend Micro Smart Protection Network™ - a worldwide early warning system that blocks threats before they can reach your business machines. Your devices will have constant access to the latest threat information. Even security for remote workers or branch offices can be managed via the Internet with the Worry-Free Services’ web-based console. So security policy or settings can be pushed to everyone on staff, no matter where they are located. Now, there’s no need for remote workers to be under LAN or VPN to get the latest protection policy. It also updates automatically, so there’s no need to spend time and resources on patching or updates. 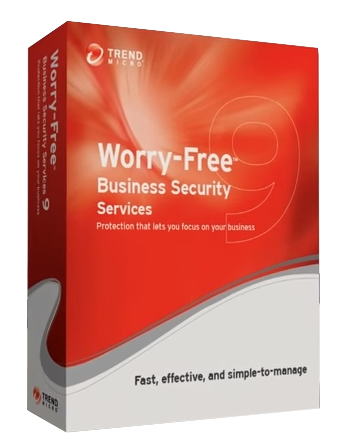 Worry-Free Business Security Services protects against viruses, dangerous websites, and other threats. As a hosted or cloud-based service, no server and no maintenance are required. It’s protection that is easy to use and manage, even for a non-IT person. In short, your time and resources can be better spent on your strategic business projects and priorities instead of worrying about your IT security. If you’d rather have your trusted IT services partner monitor your security status and alerts, Trend Micro Remote Manager provides an intuitive management console that allows your IT partner to remotely manage Worry-Free Services for you. Remote Manager can now also be integrated with industry-leading RMM/PSA tools like ConnectWise, Kaseya IT automation framework, and Autotask, to simplify support and customer management for MSPs that leverage these solutions. Behavior monitoring for suspicious behavior, such as the rapid encryption of multiple files. PDF reader Adobe™ Acrobat™ Reader 6.0. Newer versions highly recommended.